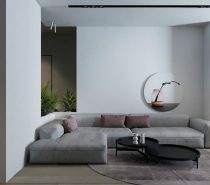 Neutral decor is a safe and soft interior design solution, but to prevent neutrals from falling flat it’s beneficial to inject some darker notes too. 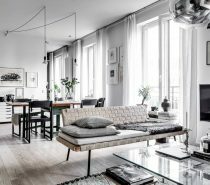 This soft grey and white apartment has a decor scheme that does just that – by incorporating some bold black base notes the look is sharpened and given more weight. A few pastels come into play here too, as sparingly placed blue hued, biscuit and blush scatter cushions. 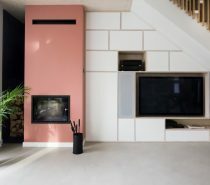 The modern home, designed and visualised by Konst, also has a kid’s room that revels a little more in the pink to mauve colour spectrum. 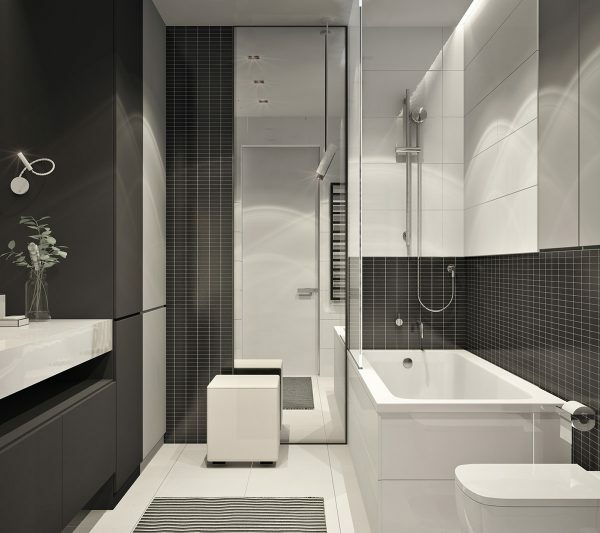 Bathrooms and connecting spaces are kept strictly monochrome and crisp. 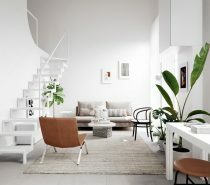 The open plan living room holds two white sofas in an L-shaped formation around a nesting coffee table set. 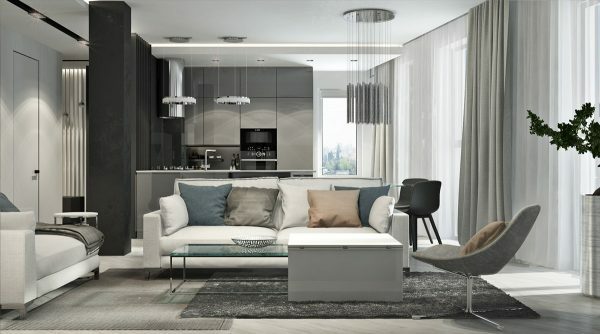 A grey modern accent chair sits opposite to complete the cosy lounge section of the room. The black and white living room is peppered with subtle blue and biscuit coloured accent cushions over the two white sofas. Perimeter LEDs, a recessed track lighting system and modern wall sconces illuminate the adjacent walkway to the bedrooms and bathrooms. 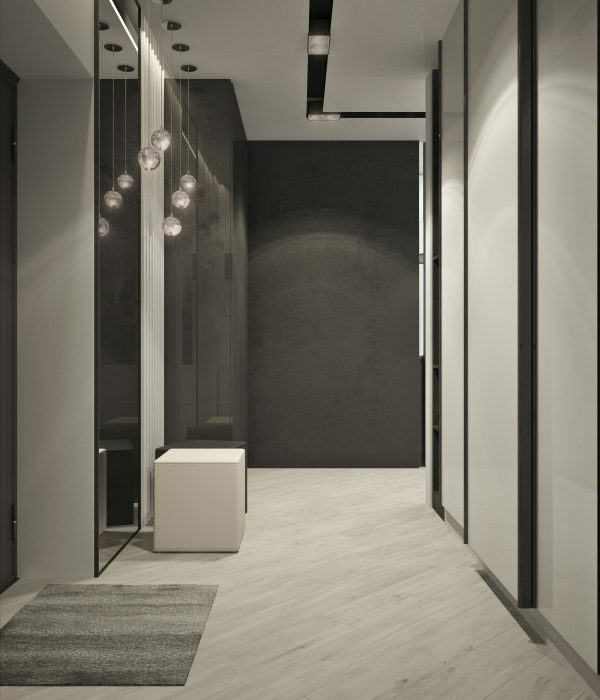 A black arc floor lamp lights the centre of the lounge arrangement. 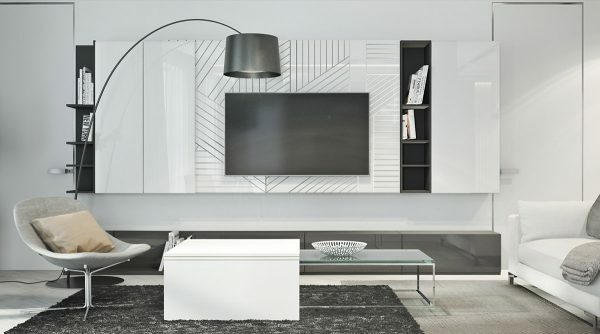 The tv wall decor creates a focal point of monochrome geometric pattern, concealed media storage cupboards and display shelving units. The living room dining room combo flows straight into the kitchen at the far end of the free-flowing space. 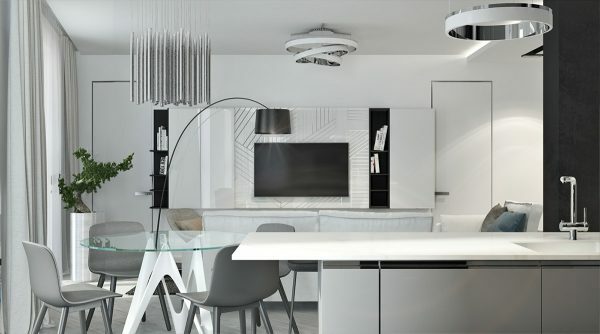 Low hanging dining pendant lights visually anchor the eating area in its spot behind the couch, and to one side of the breakfasting kitchen. The glass top of the round dining table is perched on a sculptural white support column. 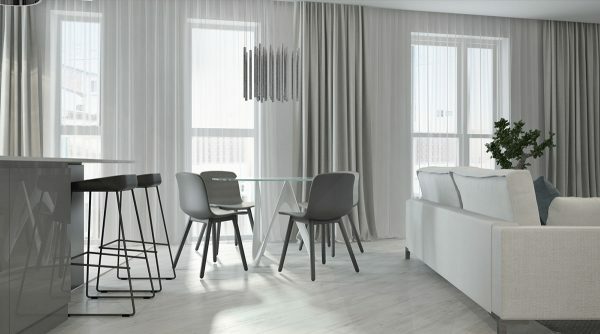 Four simple grey dining chairs complete the ensemble. 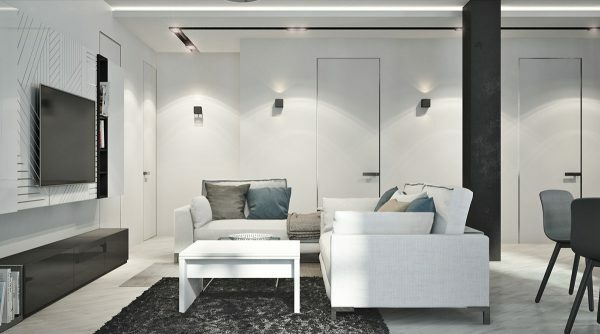 A decorative ceiling light focuses over the lounge area. Two hoop shaped pendant lights provide task lighting along the peninsula of the U-shaped kitchen, situated over the sink and breakfast bar. Two black bar stools equip the casual eating spot. 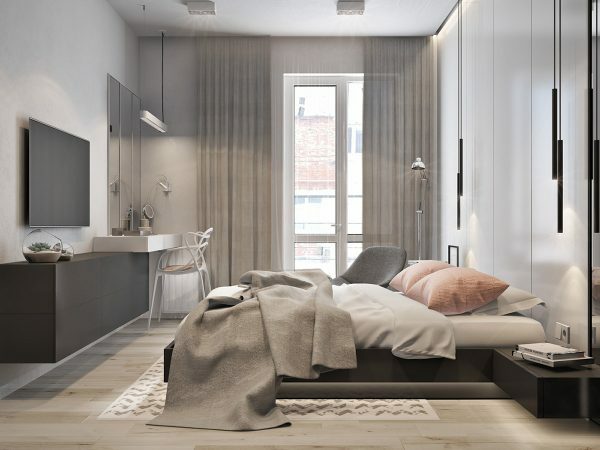 The master bedroom centres around a low slung black platform bed, dressed with soft blush coloured pillows and a grey throw. A grey bedroom chair accessorises the look, and is paired with a small side table to hold books, and an anglepoise floor reading lamp. A white chevron area rug softens the look of the wood flooring in the bedroom. 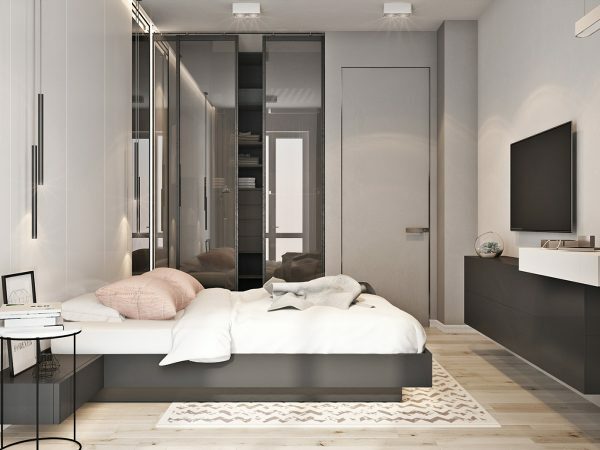 On the other side of the bed, sliding glass doors reveal a walk-in closet. 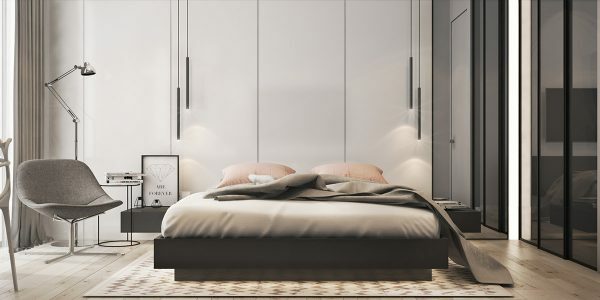 Chic bedroom pendant lights dangle over floating bedsides. 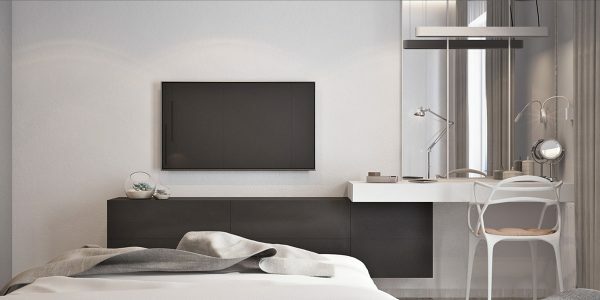 LED strips around the edge of the platform bed create a levitation illusion. 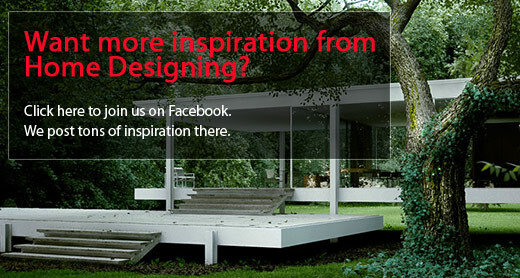 seems to be a Kartell Masters chair style one. 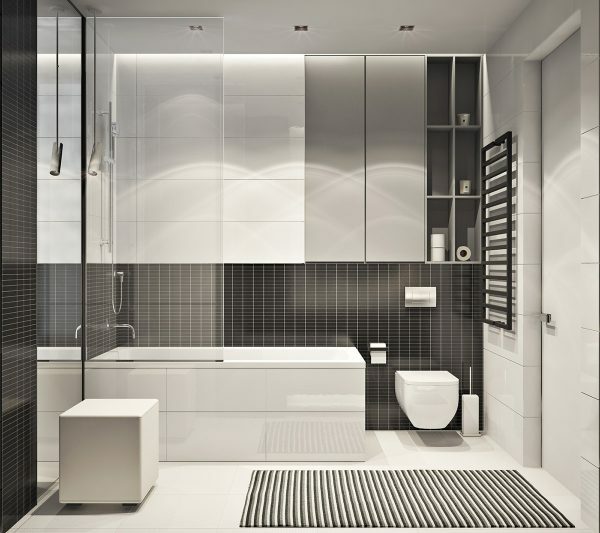 The black and white bathroom is styled in hard edges and linear forms. A cube stool sits at a long slice of mirror, in front of a very cuboid bathtub. A hard edged toilet pan protrudes from a wall clad in tiny black rectangular tile. A monochrome striped rug dresses the room. 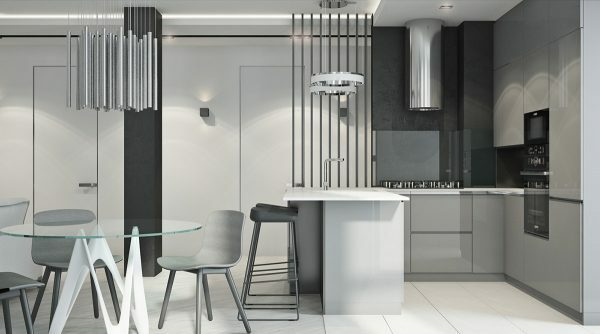 On the opposite wall of the bathroom, a linear modern bathroom vanity links with a bank of tall bathroom storage cabinets in two tones of grey. 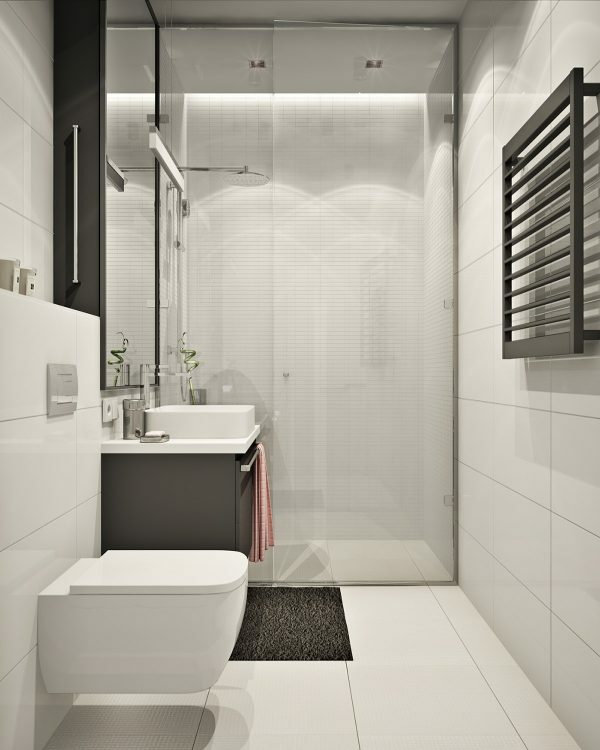 A frameless shower screen contains the splash zone of an over-bath shower. 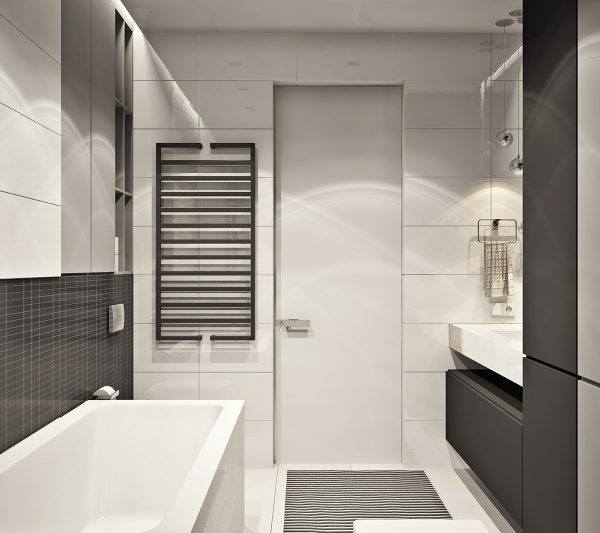 A black heated towel rail contrasts against a white tile wall. 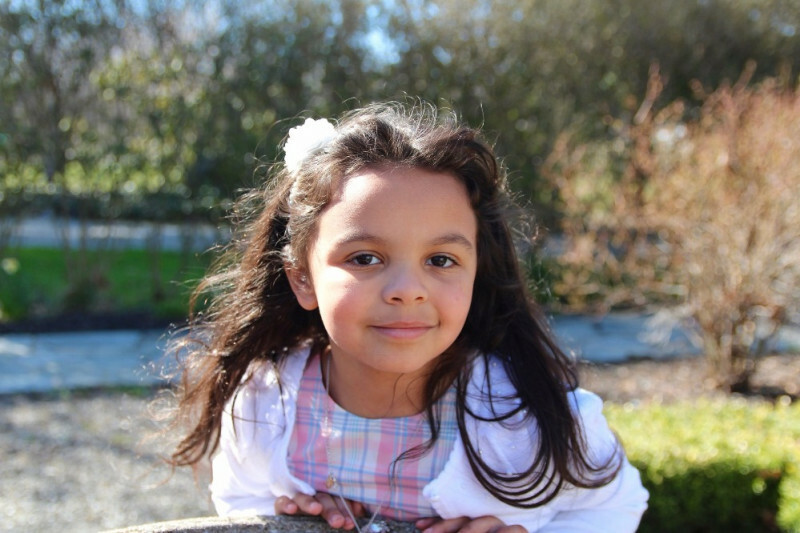 Moving away from the adults quarters, a pink kids’ bed stands out against soft grey wallpaper with white polka dots in this girl’s room. The kid’s decor incorporates a sheer bed curtain that is suspended from a slatted ceiling installation running the length of the bed. A pair of pendant lights and a trio of mauve paper ball decorations are also suspended from the unique ceiling feature to make the sleep space cute and cosy. A faux sheepskin rug warms the wood floor underfoot. The opposite side of the kid’s bedroom has gloss white wardrobes that have been adorned with a personalised height chart decal. More kids’ wall decor spans the gap between a vanity area and a study. 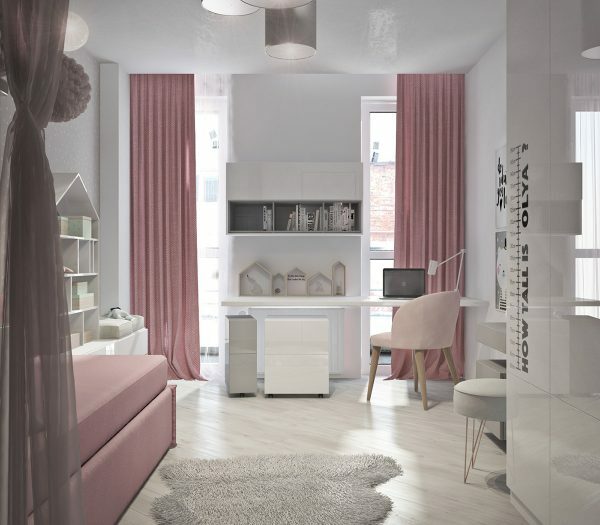 A pastel pink chair sits at the kid’s study desk. 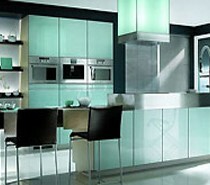 Wooden house shaped shelves dress the worktop. Light pink drapes pool at the foot of two floor to ceiling windows. 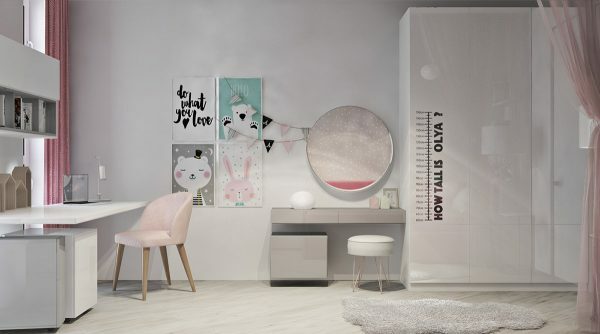 The kids bathroom is decorated in a monochrome decor scheme to match the rest of the apartment, but a single baby pink hand towel sweetens the vanity area – bringing in just a hint of the kid’s bedroom colours. The vanity unit itself is a black cabinet with a crisp white top and rectangular countertop basin. 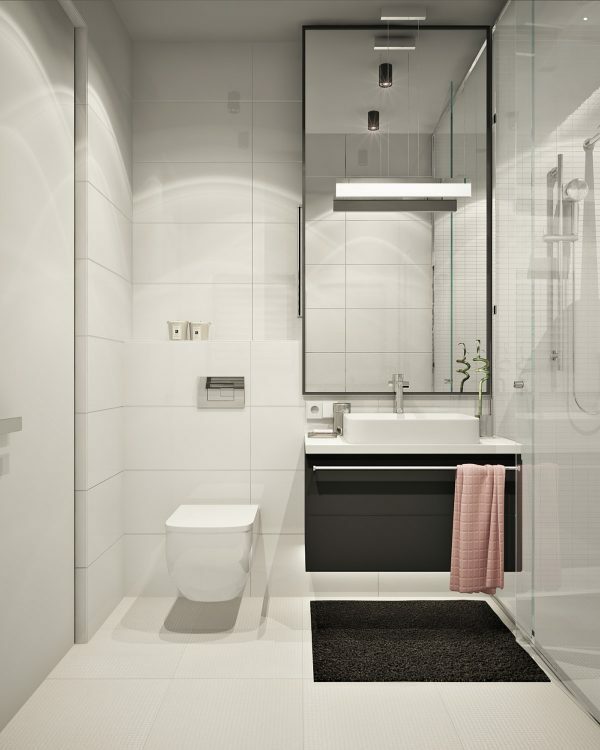 Chrome fixtures reflect the light, and settle subtly into the white surroundings. 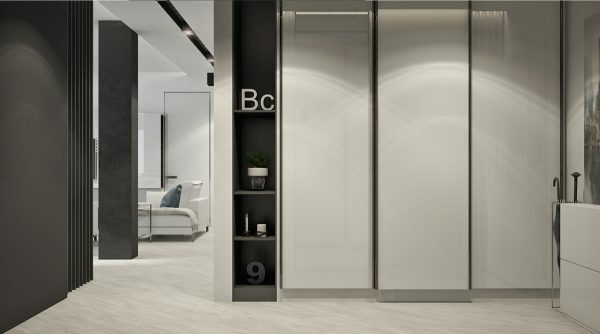 Smooth white doors conceal generous storage space in the home’s hallway. 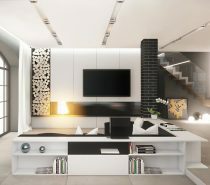 A set of black shelves allow for a neat selection of decorative items to be displayed – just enough to take the plainness off the space. 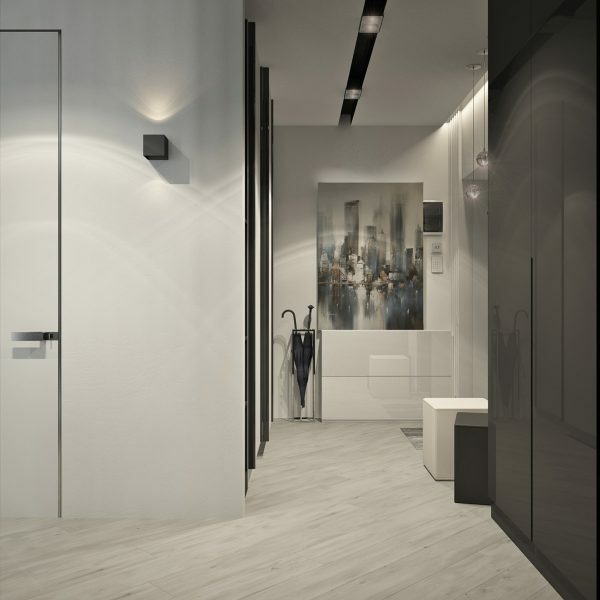 A white gloss shoe cabinet and a modern umbrella rack inhabit the end of the hall, beneath a piece of modern art. 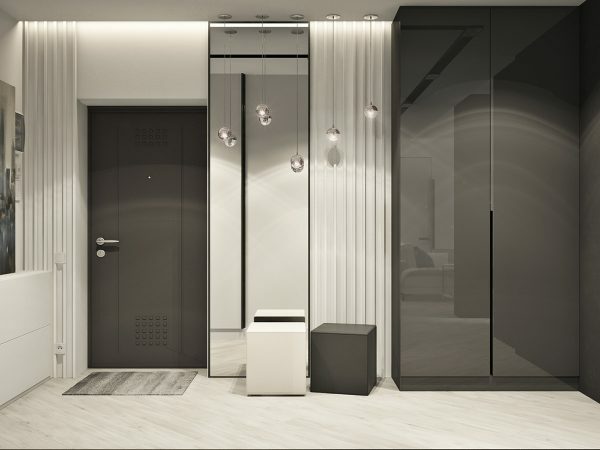 Black and white cube stools sit in front of a full length mirror by the front door. A series of five small orb pendant lights twinkle over the little hallway seating area, making a special feature of a transient spot. 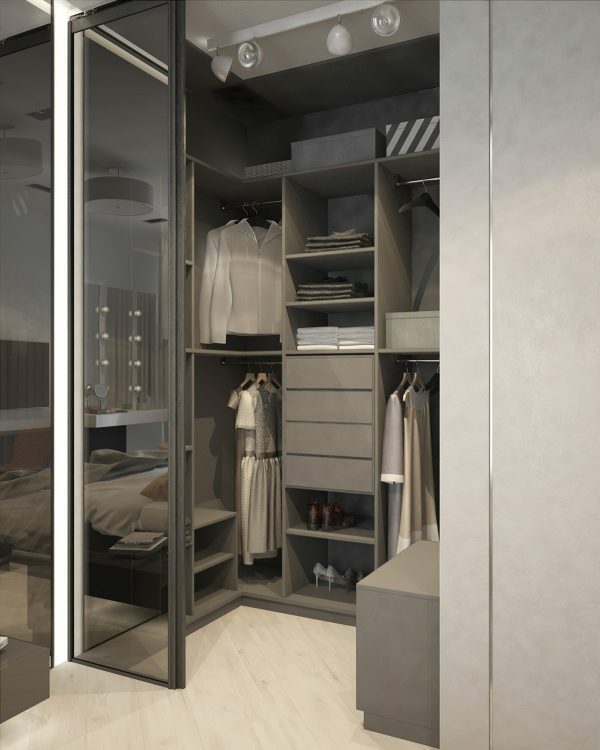 A closer look at the walk-in wardrobe in the master bedroom suite – with the glass doors drawn all the way back.